Both restroom's sink and vanity areas include black Corian vanity countertops with a stainless steel sink basin. The stainless Chicago brand single lever faucet delivers hot and cold running water. 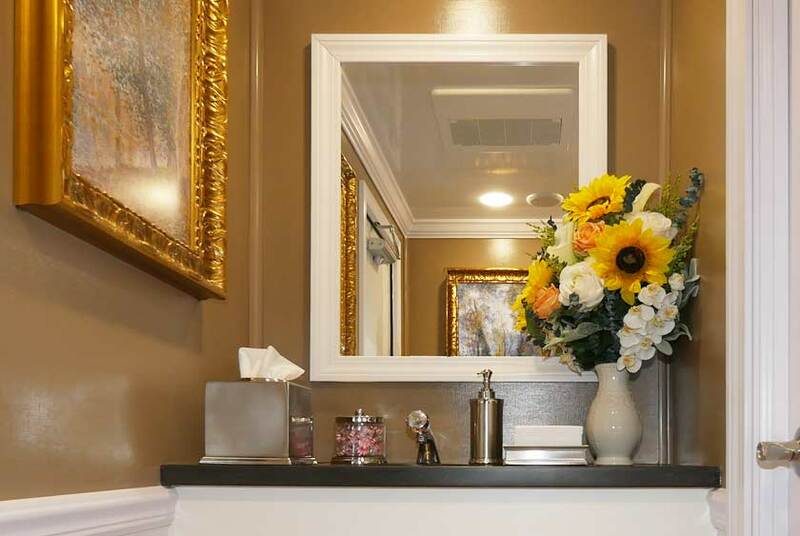 A designer antibacterial soap dispenser, hand towels, filled stylish tissue holder and candy dish brings an extravagance to every guest's trip to the restroom. 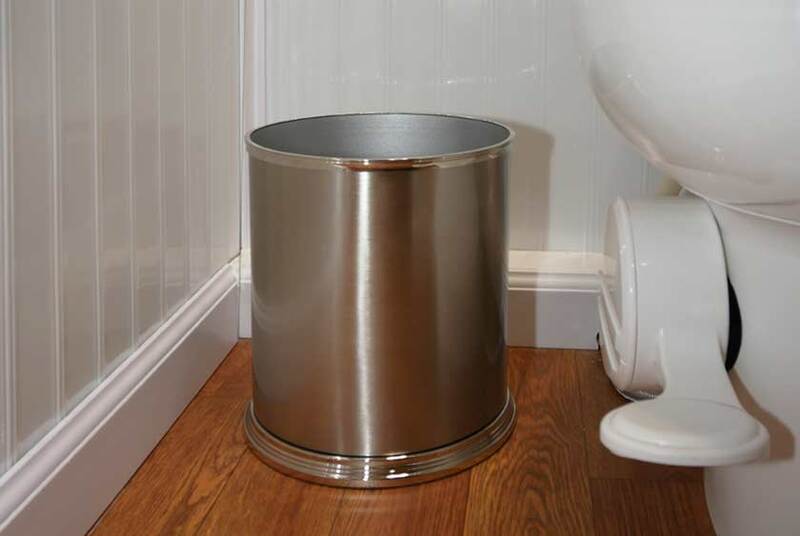 A built-in trash receptacle in the vanity will help to keep the restroom and vanity area clean. 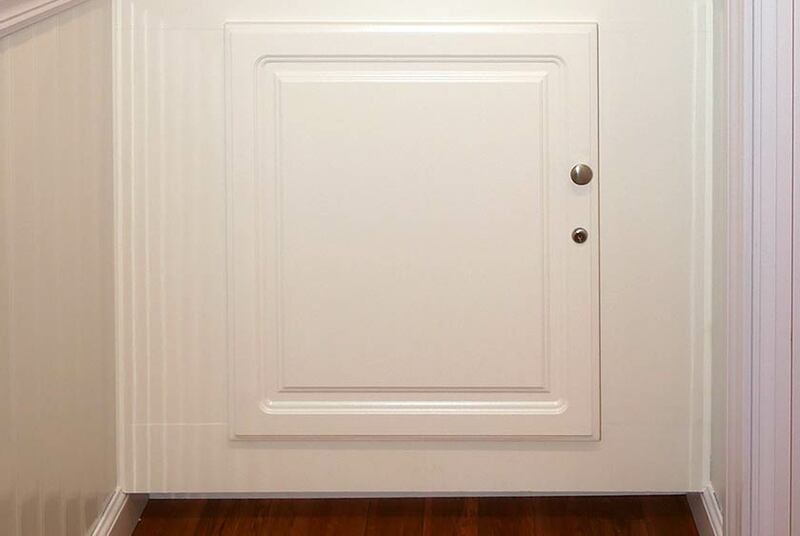 There is also a storage area beneath the sink for extra supplies. 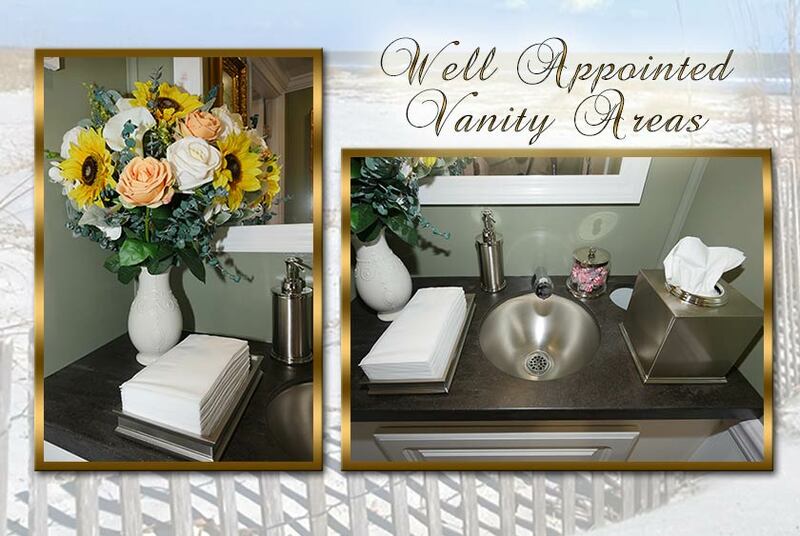 For an added beautiful touch, the vanity area has a custom ﬂoral arrangement that will impress every guest. Both the women's and men's bathroom stall doors have a stainless brushed nickel handle and stainless locking system. 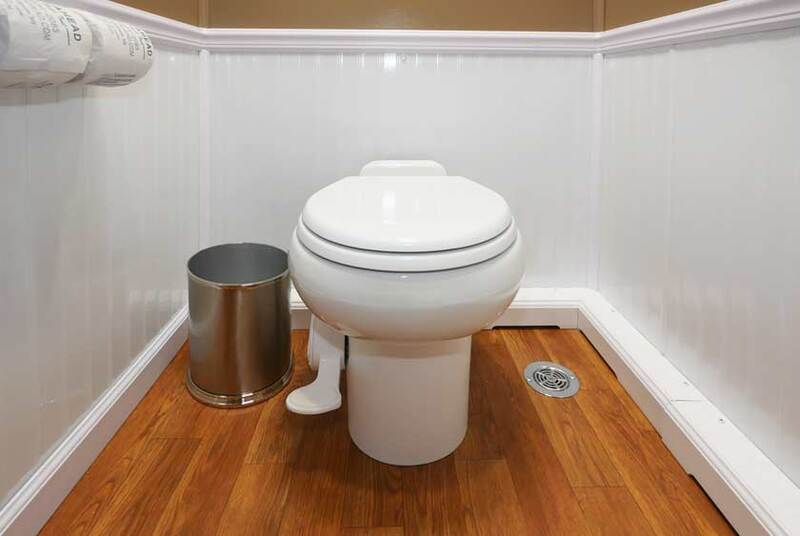 There is a porcelain ﬂush toilet bowl with a pedal ﬂush for hands-free operation. 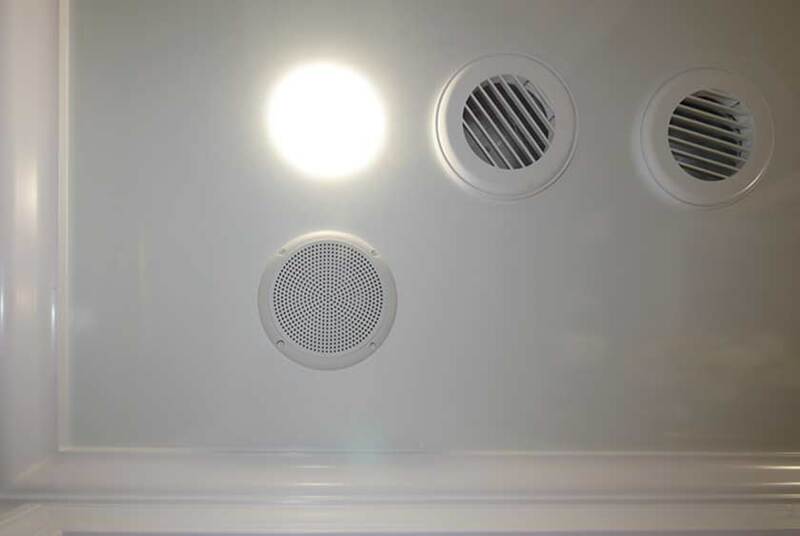 A stainless double toilet paper holder, trash receptacle, and ceiling vent are inside each stall. 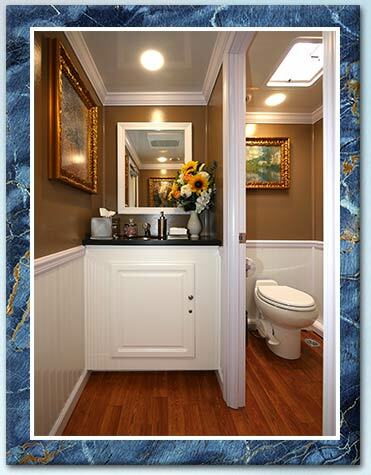 Gorgeous framed artwork enhances the very spacious bathroom stalls. In the men's restroom, there is also a separate urinal area enclosed on three sides for privacy. 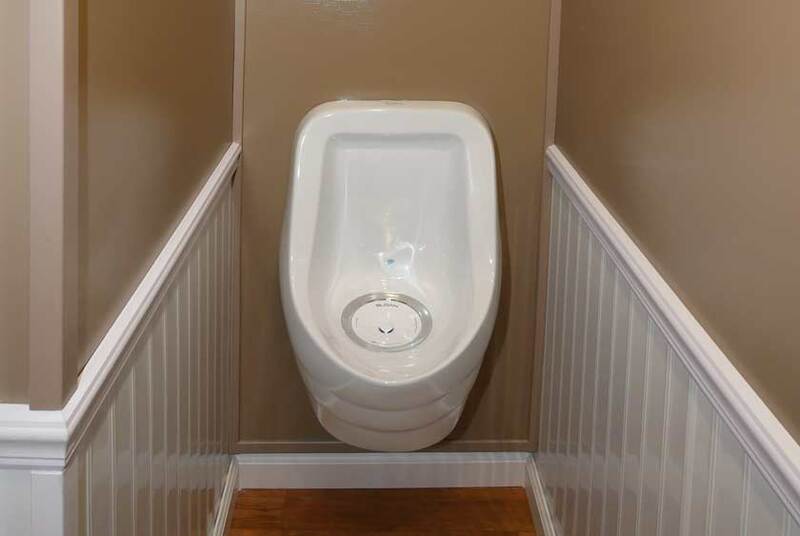 The porcelain urinal is waterless and operates completely odor-free due to an exceptional filter system. 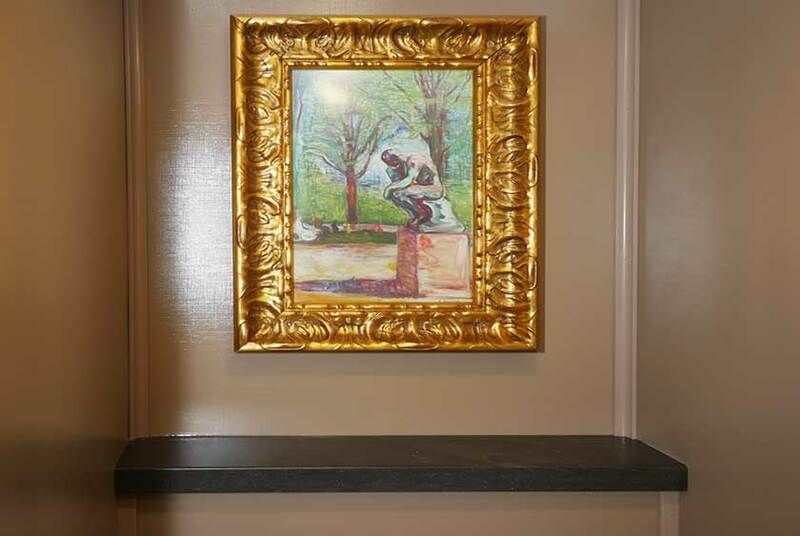 Above the urinal, there is a shelving area and custom framed artwork. 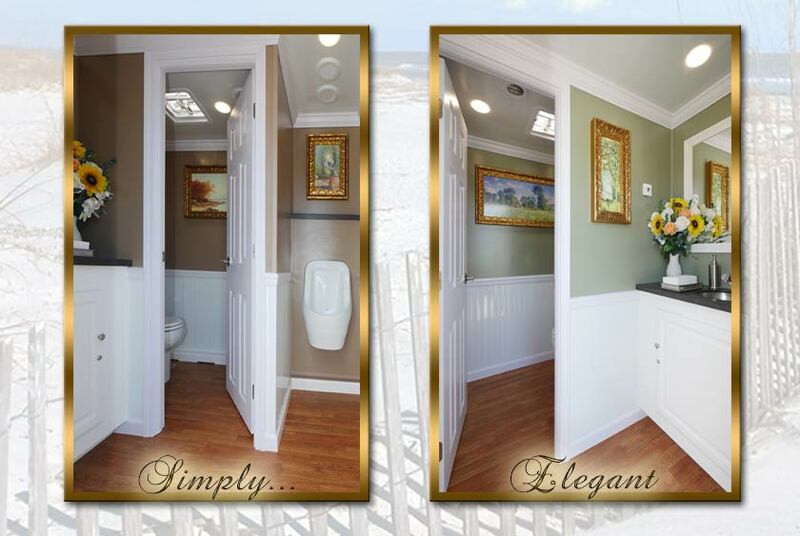 With the AMAGANSETT luxury restroom trailer, you will be confident you are providing your guests with the most sanitary restrooms in the industry. 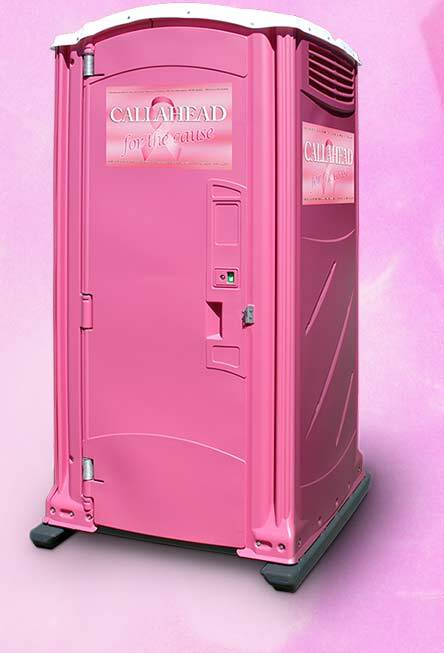 Only CALLAHEAD uses hospital grade cleaners and disinfectants so you can be self-assured you will be providing your guests with the cleanest restroom trailer facilities available anywhere. 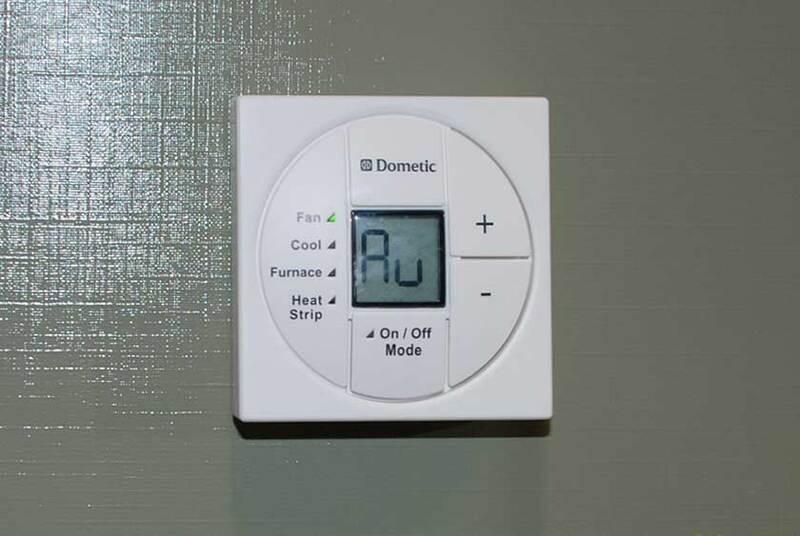 The AMAGANSETT's Dometic brand thermostat heat and air conditioning in addition to the wall mounted fan forced heaters in both restrooms will bring a comfortable trip to the restroom any time of year. 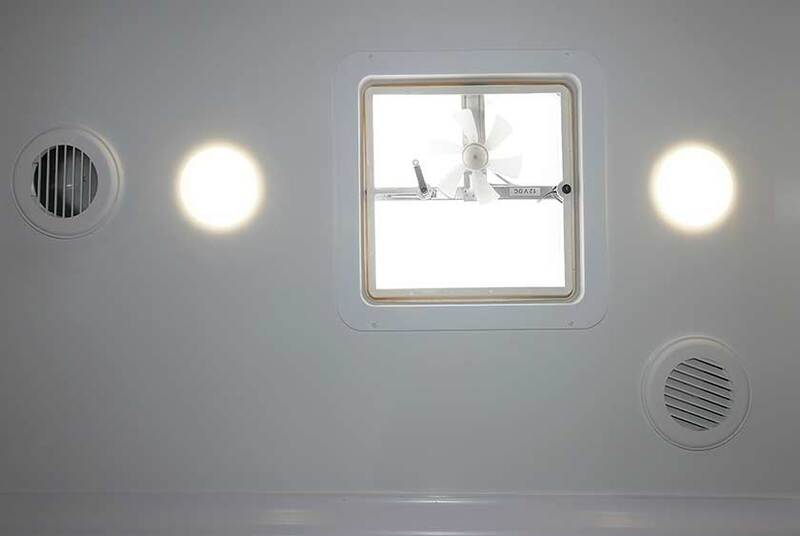 High-hat LED ceiling lighting will bring plenty of light inside the restroom trailer. Only a generator or 110-Volt outlet is necessary for electric. The AMAGANSETT is delivered to you by a CALLAHEAD uniformed delivery specialist. 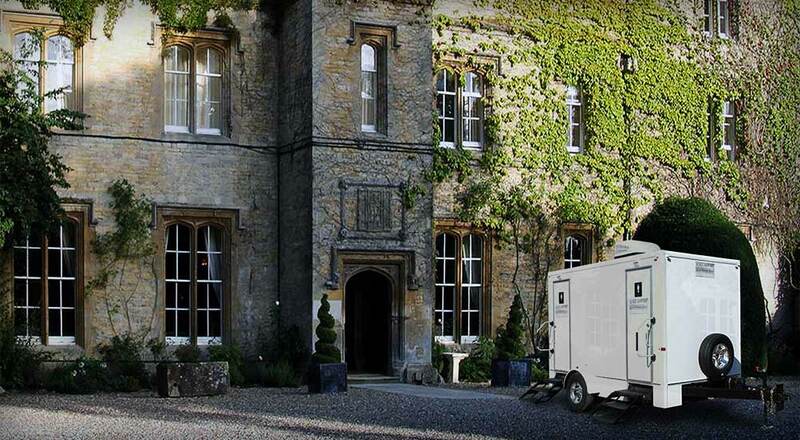 It will be professionally set-up and fully stocked with all the luxury amenities. 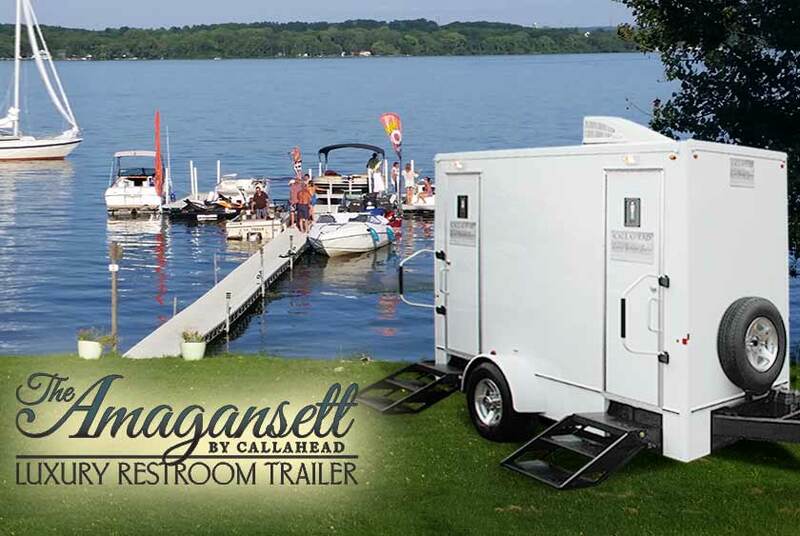 This is an ideal restroom trailer rental to provide convenient and luxurious bathrooms to any formal or informal social gathering.We also offer the option of our CALLAHEAD professional uniformed restroom attendant to keep the AMAGANSETT in perfect condition for your entire event. 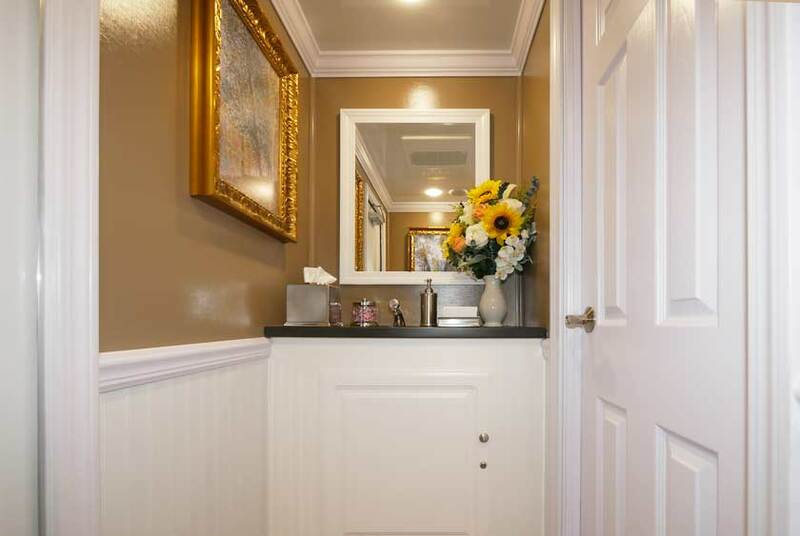 Like with any CALLAHEAD product, you will never have to worry about service with the AMAGANSETT luxury restroom trailer. The AMAGANSETT is available for delivery throughout all of New York City's five boroughs of Brooklyn, Queens, Manhattan, Staten Island, and the Bronx as well as all of Westchester, Nassau, and Suffolk Counties to Montauk Point. 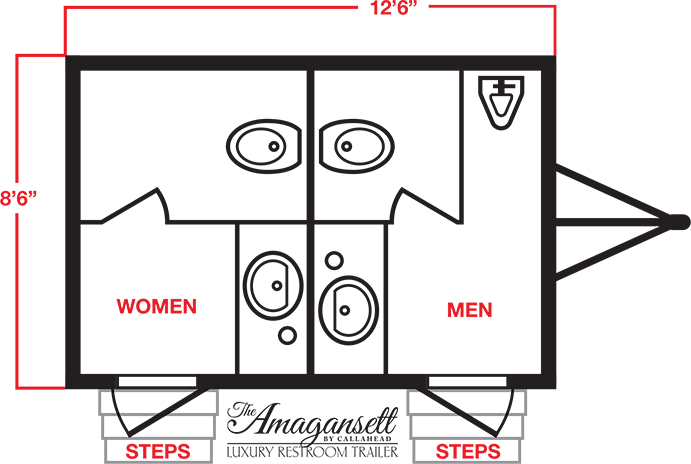 CALLAHEAD has been in business since 1976. 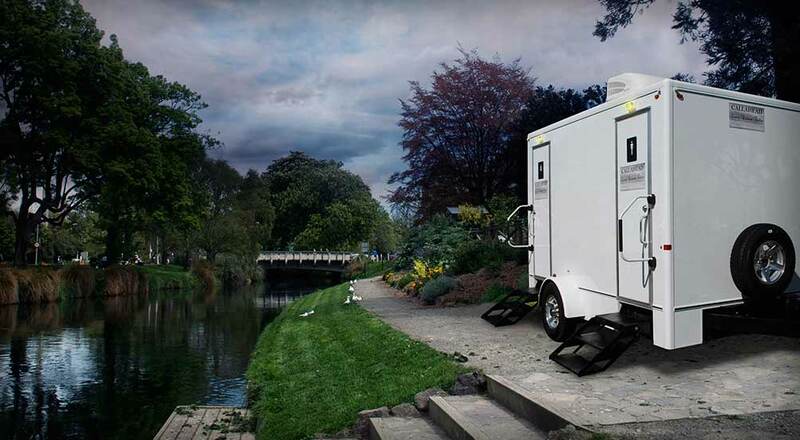 We have invented more for the portable sanitation industry than any other company in our field. 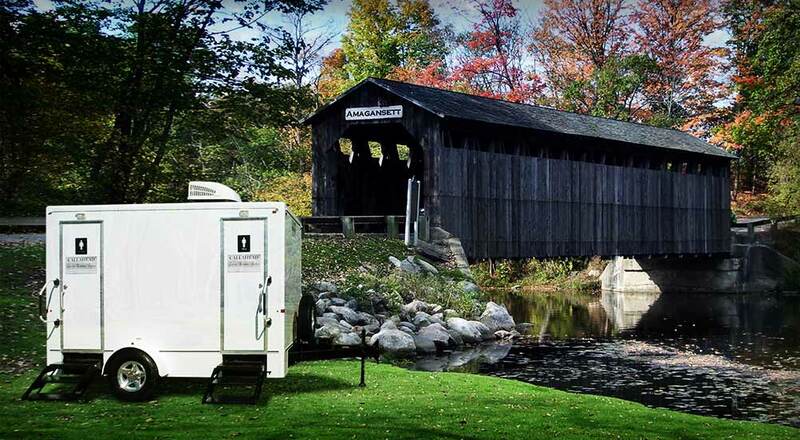 Our numerous innovations and dedication to perfect service have made us the largest and most trusted portable restroom company in New York. 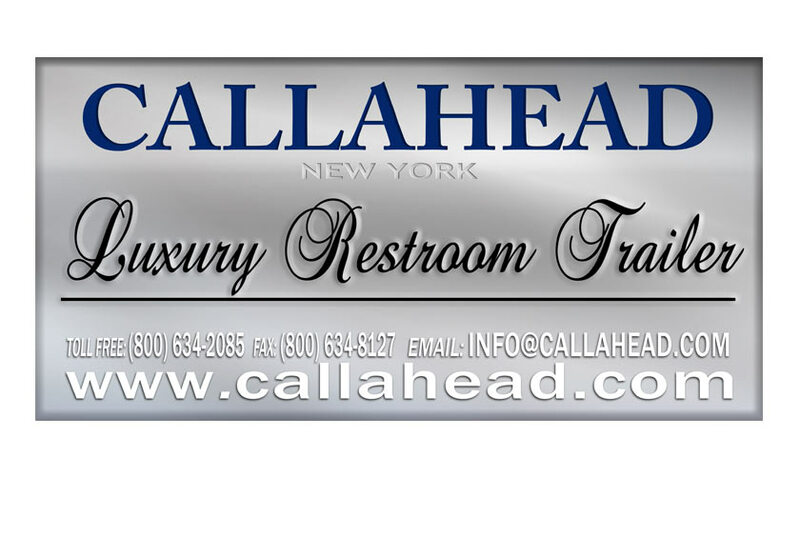 Quite simply, CALLAHEAD is the world's greatest portable sanitation company ready to deliver the best equipment and service for you. For more information about the AMAGANSETT luxury portable bathroom trailer or any of CALLAHEAD's state-of-the-art equipment, including restroom trailers, VIP portable toilets, standard portable toilets, portable sinks, porcelain toilet systems for office trailers, security guard and ticket booth rentals, holding tanks, fresh water delivery, commercial portable sinks, portable hand washing sinks, antibacterial and hand sanitizing dispenser rentals, long-term or short term portable toilet rentals, long-term or short-term restroom trailer rentals, portable shower rentals, and portable storage shed rentals please contact one of our expert sales specialists at 800-634-2085 or visit our website for full photos, details and videos of our equipment for all your portable sanitation needs at www.callahead.com. 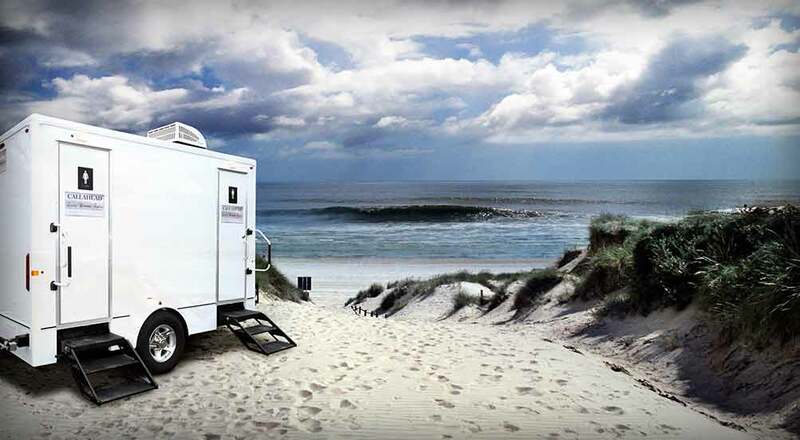 The AMAGANSETT is a CALLAHEAD 3-station luxury restroom trailer for New York special events. Equipped with separate women's and men's restrooms, the AMAGANSETT will supply bathroom facilities that are clean, comfortable and luxurious. 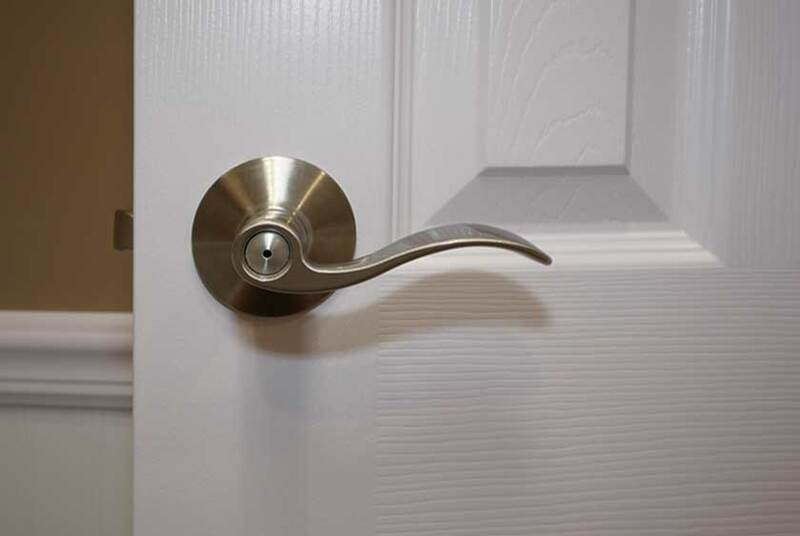 This is the perfect rental when you need more than one bathroom while also providing the best restroom facilities for your guests. 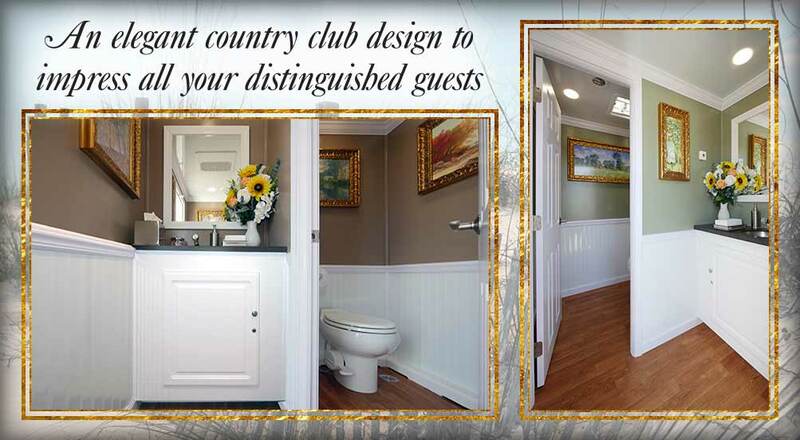 The AMAGANSETT has an elegant country club design with all the extra VIP amenities included. From custom framed artwork, ﬂowers, and wood trim work the AMAGANSETT has all the finest details. 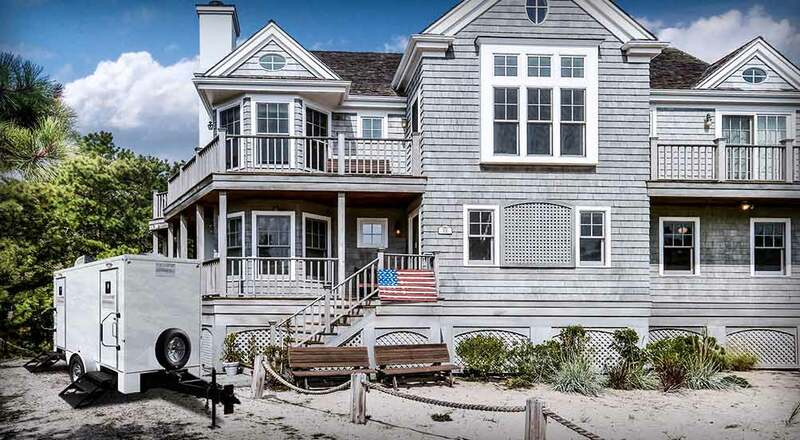 To ensure comfortable temperatures through every New York season, the AMAGANSETT is equipped with a thermostat heat and air conditioning system. 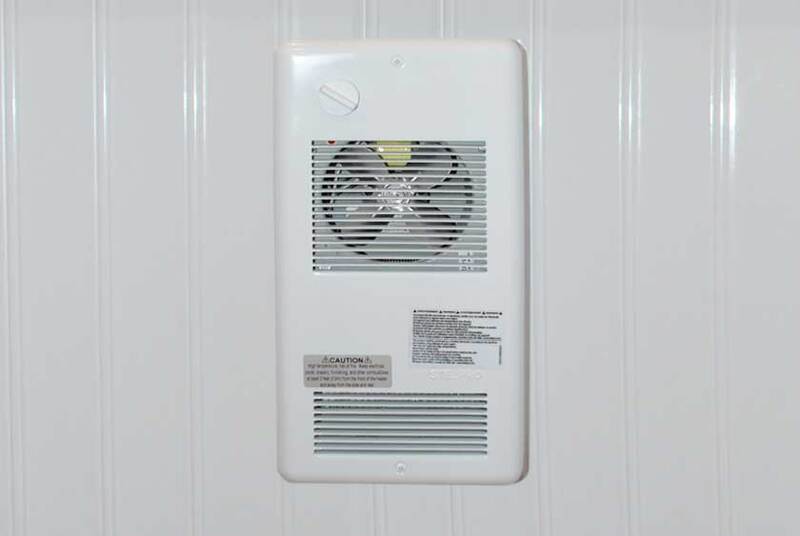 For the colder winter months, there is also a wall mounted fan forced heater. 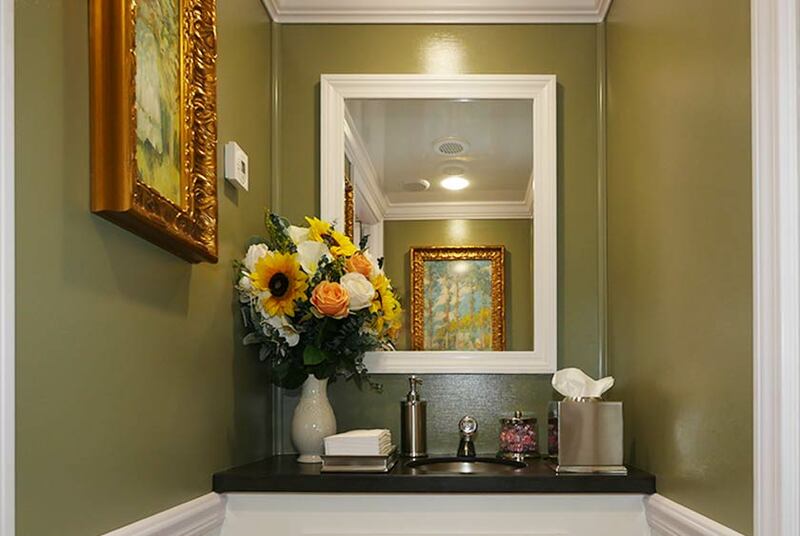 The surround sound music system, stainless vessel sink, vanity mirror, antibacterial soap dispenser, hand towels, filled tissue holder and candy dish will no doubt impress every guest. On the women's side, there is an extra-large enclosed bathroom stall with ﬂoor to ceiling lockable wood door. The men's restroom also has a very spacious bathroom stall plus a Sloan waterless urinal. The AMAGANSETT has a bright white exterior with exterior lighting to accommodate both day and evening events. 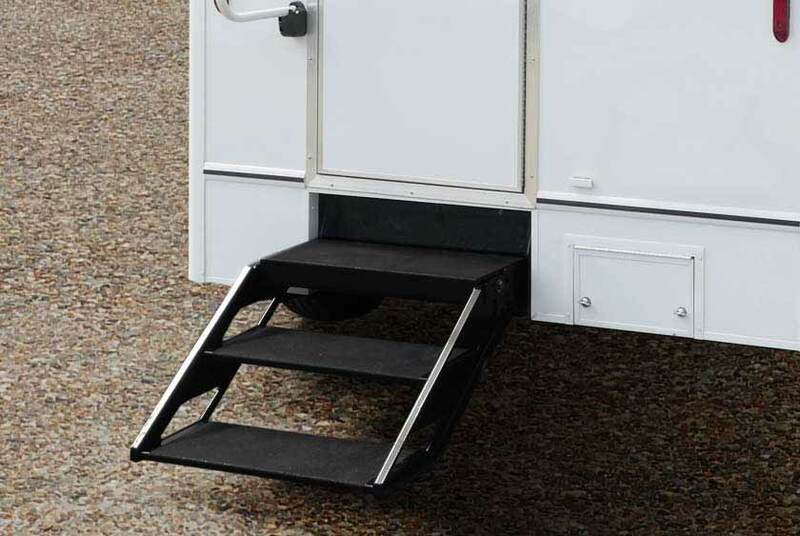 You enter both the men's and women's restroom using the sturdy ﬂoating staircases with aluminum handrails. 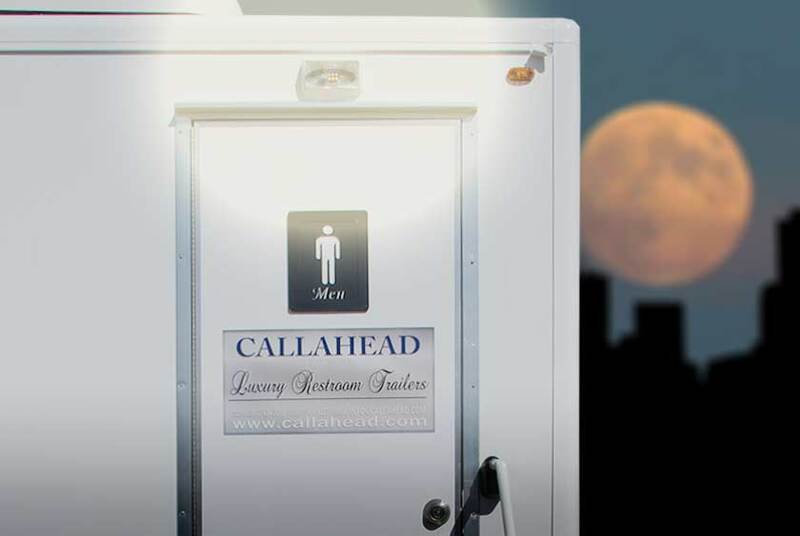 The separately marked restrooms display CALLAHEAD's signature signage letting your guests know you rented the very best in restroom trailers. 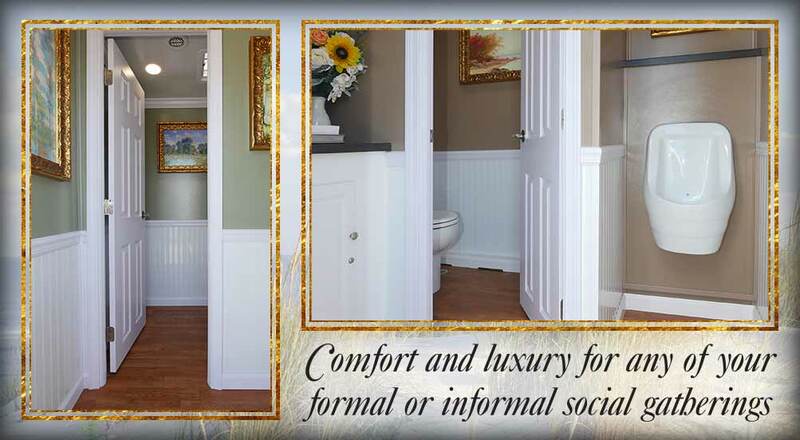 The white painted wood trim work and 3-foot wainscoting extend throughout the entire restroom. 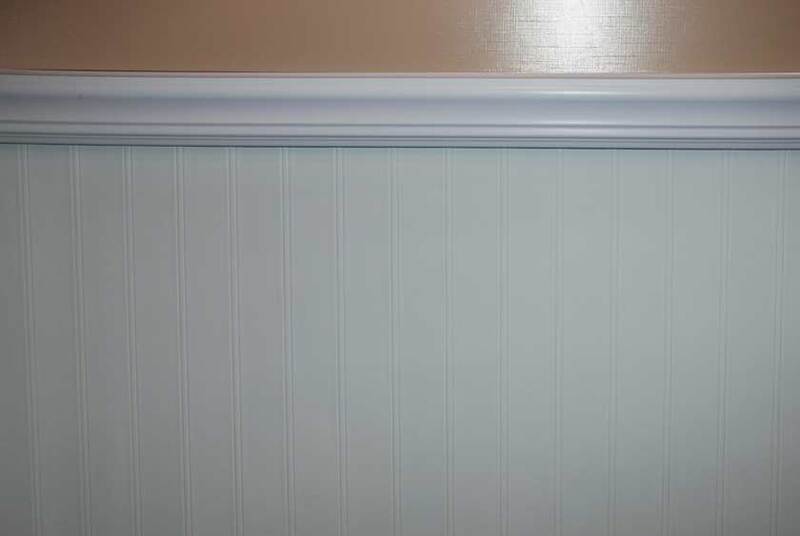 The AMAGANSETT also has wood base moldings, chair rail moldings, and crown moldings. 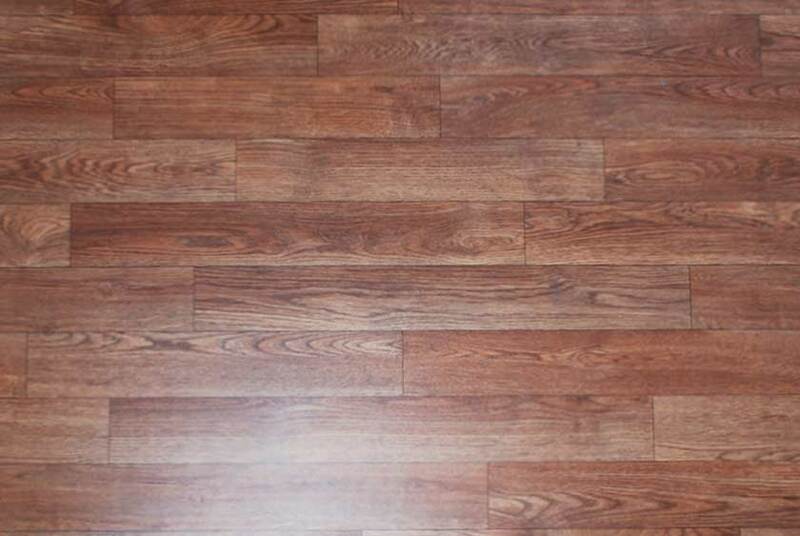 Wide planked Armstrong ﬂooring adds a warm, homelike setting to the restroom. 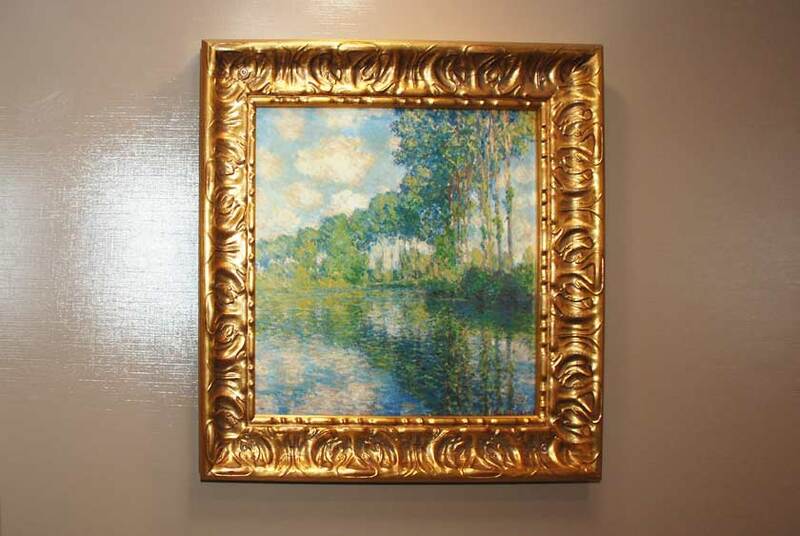 Beautiful fine art prints of landscapes are custom framed in gorgeous gold Michelangelo frames.